Today I attended a public gathering, in Egypt, of more than five political activists that did not end in mass arrests, acts of violence and a Gomhoreya article describing the incident as an act of willful disorder by foreign agents. 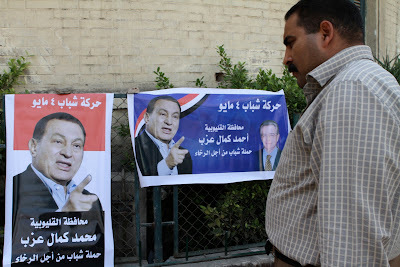 The world is not about to spin off its axis however; the “march” was organised by members of the May 4 Movement, a love-in for Hosny Mubarak which, on its Facebook page, describes that eternal gentleman as the “leader of the new thought brigade” and urges him or his son to sit on the Egyptian people for yet another five six years. This being a pro-regime affair journalists were left in peace but we were screwed over anyway by being dragged out in weather so hot I imagine it is what the temperature would be like if hell invited the sun over for chili fajitas. We were then left to melt for approximately one hour. I sat opposite the Nour Mosque and watched two coffins thrust aloft a sea of hands go in and come out on their final journeys. I was struck by how quickly they moved. Much quicker than the traffic below which skulked past in its usual cloud of lead, noise and invectives. 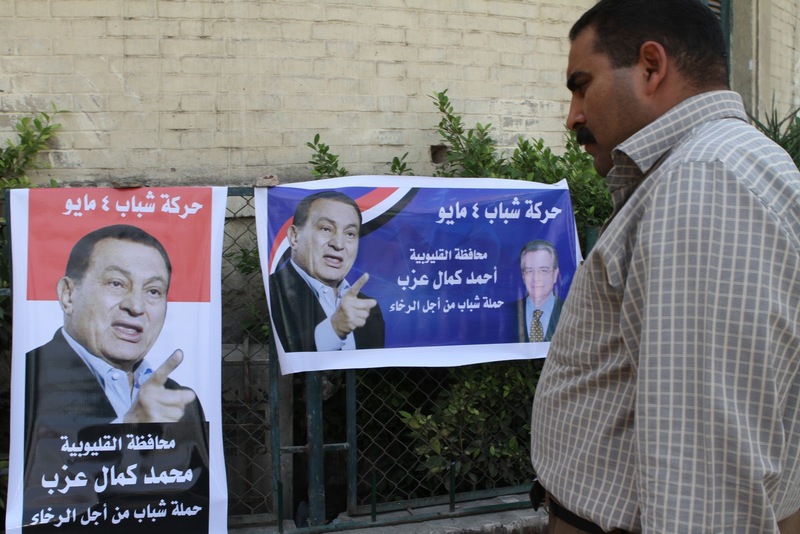 The Mubarak lot eventually had the good grace to show up, an hour late, and assembled on the pavement opposite the mosque where they unfurled flags and printed posters and handwritten signs. Suddenly everything was a sea of Hosnies. Everyone stood around looking at each other and wandering what to do until a Japanese journalist turned up, giving two “protestors” the opportunity to show off their English. A state security scribe sloped onto the scene with his clipboard like a friendless loser at the junior high ball and they went through Youssef, Oosha and numerous other variations before it was eventually established that the man’s name was Yushi. 3. Every Egyptian home now has more than one electrical device in it, unlike the 1970s when it was either a transistor radio or a telly. I noticed that several of the protest “leaders” there had gold-rimmed, pimp, sunglasses on, and for this reason I initially had difficulty differentiating them from state security officers, with whom they were very pally. Cigarettes were offered around out of a silver and leather cigarette case. I overheard one bloke say “El 2akh men 2amn el dawla by2ol…” which is an interesting variation on the epithets applied to state security officers I usually hear at protests. There were a couple of kids there. One embarrassed-looking 14 year-old had clearly been strong-armed into coming by his dad, a small, cheerful man in his sixties. “aih ra2yek fe ebny? Negm” [What do you think of my son? He’s a star] he asked/told me. 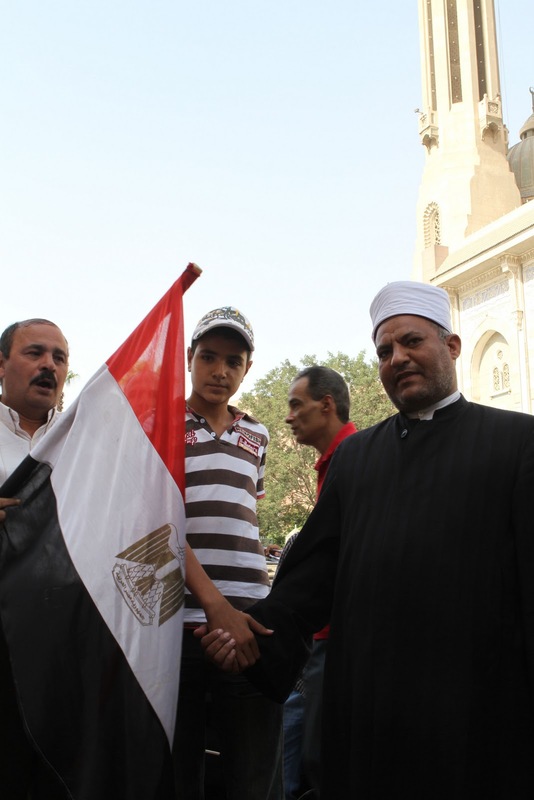 The son had been thrust into a photo opportunity with an Imam and an Egyptian flag, in what seemed to be an attempt to show the breadth of national unity and complete absence of sectarian conflict in Egypt. The man turned out to be quite interesting because he informed me that he was trying to set up a union for domestic workers. Alas the conversation soon went south. MAN: I’ve been to the National Council for Women’s Rights about this but nothing’s happened. ME: Why don’t you talk to human rights groups? MAN: No, no. I don’t like them. ME: Uhm. I know a good lawyer who’d be interested in helping. MAN: I have a lawyer working with me. 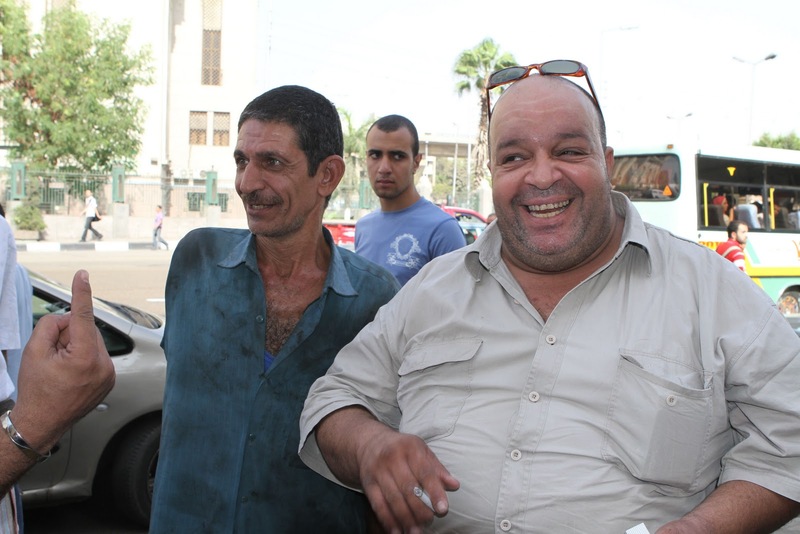 It’s Nabih El-Wa7sh. ME: Good luck and goodbye. Having exhausted every possible camera angle known to man and grown tired of hearing about bridges I inquired whether the men were thinking of doing any marching in the near future. 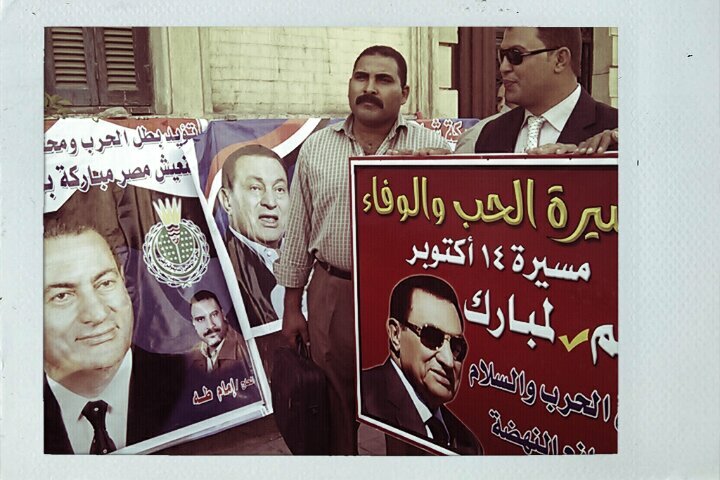 Initially the journos were told that the march had been delayed pending the arrival of millions of Mubarak supporters. Then a tall man in a suit and sunglasses dropped a bombshell. Security bodies had cancelled the march! He was asked whether he knew that this would happen before it was announced. He said of course he did but that he didn’t actually decide to start it here and that it was up to him he would have began it near the presidential palace “inshallah 200 metres away. That would still be a march”. However behind the obfuscation was the real probability that, like a man blaming erectile problems on the drink, they were simply embarrassed that no one had shown up. They’re an odd lot these pro-regimistas. As they went on about peace and stability and free elections (yes, honestly) I kept expecting them to say ONLY JOKING! But they went on and on and their hearts and their heads seemed to be in it. I was reminded of a comment someone posted on my Facebook recently in which he said that he thought an account of torture and police harassment had been made up, cast doubt on whether Khaled Said had been murdered by the police and accused local human rights organizations of publishing lies for their own agendas. Today’s march may have been a farce but it is easy to forget how representative their views are. Commentators always like to describe the Egyptian people as a pent up ball of fury on the cusp of revolution but this ignores the many people who, regardless of being shat on day after day either believe that the Mubarak status quo is better the devil you know than the one you don’t, are frightened of change, just want a quiet life or have bought into the idea of The Threat from Without (Salafi Islam, Hezbollah, men with beards in general, Israel, Palestinians, Algerian footballers, Facebook, GPS before it was licenced, Iran before Iran-Egypt flights were licenced, religious minorities, neighbours with which Egypt has to share Nile water, neighbours with which Egypt has to share a border, homosexuals, Western moral depravity, half-Egyptians, Saadeddin Ibrahim, the Chinese artificial hymen,) by which the regime has “justified” its existence, and its policies. Creating this immutable link between change and an existential threat to Egyptians’ well-being has been the regime’s master stroke. A cheerful gentleman who engaged in mild banter with the pro-regimistas. "Saba7 el fol" he said when he saw me photographing him. It's either Saad el-din ibrahim or Son3ala ibrahim. Don't (con)fuse them both. A presidential period is 6 not 5 years.